But in late 1988, tensions between Washington and Tripoli raised again. In fact the United States government accused Libya of building a chemical weapons plant near the town of Rabta and once again Gaddafi warned the U.S. against interfering in Libyan affairs, reiterating the threat of military actions. In response to Gaddafi’s menace, the USS John F. Kennedy (CV-67) and its battle group were dispatched to conduct a “freedom of navigation” exercise off the Libyan coast. On Jan. 4, 1989, in the morning, four pairs of F-14s, two of those belonging to the VF-14 Tophatters and two with the VF-32 Swordsmen, were flying Combat Air Patrols (CAP) close to the Gulf of Sidra, while a single E-2C from the VAW-126 Sea Hawks supported them. For several years, due to terrorist concerns, the crews had to remain anonymous and their names withheld from reports, but today we know that the two VF-32 Tomcats on the southernmost CAP station, were the BuNo. 159610, call sign “Gipsy 207” flown by Swordsmen skipper Commander Joseph B. Connelly and by Commander Leo F. Enwright as Radar Intercept Officer (RIO) and the BuNo. 159437, call sign “Gipsy 202″ crewed by Lieutenant Hermon C. Cook III and Lieutenant Commander Steven P. Collins as RIO. The two F-14s were armed with four Sparrows and two Sidewinders, since they were launched before the intended loadout of four AIM-7s and four AIM-9s was complete. After being refueled by a KA-6D Intruder, the two F-14s with Gipsy 207 leading the section, returned to their CAP station, when the Hawkeye, call sign “Closeout”, warned them that two Libyan aircraft had taken off from Al Bumbah airfield. Almost immediately the contact was picked up by the Tomcats radars at a distance of about 72 miles and locked up: this procedure was aimed at alerting the Libyan fighters that they were monitored by armed F-14s. Several times this was enough to persuade them to turn away, but this time the bogeys kept coming. The Tomcats began the engagement at 20,000 feet descending toward the bogeys that were descending from 10,000 to 8,000 feet. The two F-14s performed also a thirty degrees turn away from the enemy fighters but the bogeys countered it with a turn which placed them in a fast collision course against the Tomcats. But the turn executed by the American fighters also to put the F-14s between the bogeys and the aircraft carrier, giving to the Tomcats an advantage position to provide protection to the USS Kennedy. 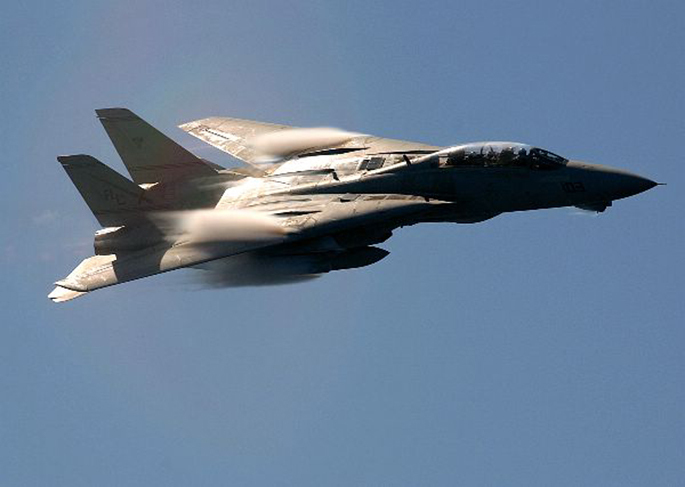 What nobody could know, was that in a matter of few minutes the events that had started as an almost normal close encounter would turn into a real air to air combat, as reported by the Rear Admiral Paul t. Gillcrist in his book Tomcat! The Grumman F-14 Story. At 11:58:43 the US fighters leveled off at 3,000 feet and 475 knots, while the bogies were closing on a collision course at a range of 53 miles and descending. To avoid a head-on engagement with the enemy aircraft armed with radar guided air to air missiles, the F-14s turned a second time trying to offset themselves from the bogeys, hoping to gain a tactical advantage. Less than one minute later, at 11:59:16 the Libyans, controlled by their own ground controlled radar, had already turned back towards the Tomcats with a closure speed of about one thousand knots. The air warfare commander on Kennedy transmitted to the two Swordsmen crews the coded signal “Warning yellow, weapons hold, I repeat, warning yellow, weapons hold”. This radio call caused some misunderstanding since it was interpreted that the F-14s were not cleared to fire, but a “yellow, weapons hold” is used to alert the fighters that there is a possible threat to the battle group (warning yellow), and weapons hold reminds that peacetime ROE (Rules Of Engagemt) still apply and the fighters must assess hostile intent or threat, or act in self defense in order to shoot. At 12:00:53 Enwright reported that bogies had jinked at him for the fifth time and that the Libyans were inside of twenty miles: at this point he directed the section to turn “on” the master armament switches. At a range of exactly 12.9 miles Enwright aboard Gipsy 207 fired a Sparrow missile and Connelly executed thirty degree turn to the left while Cook III onboard Gipsy 204 performed the same maneuver to the right. In this way, at 12:01:20 the two F-14s turned back into the bogeys and Enwright fired a second Sparrow. Connelly still couldn’t see the enemy fighters but he noticed that on its right Gipsy 202 fired a Sparrow and at the same time Cook III called “Tally-ho, eleven o’ clock high. They are turning on me” and he casually told to Collins “They got one off”. This statement caused some confusion, since Enwright believed that the now detected MiG-23s had fired and he began to release defensive chaff bundles. Meanwhile Connelly followed Gipsy 202 missile flight which exploded into the right intake duct of the second Flogger. At 12:01:57 Gipsy 207 began a hard right turn to position himself to the six o’clock position of the lead MiG-23 which was passing in front of him from left to right. The second damaged Flogger instead, streaming black smoke entered a right turn and was lost from view after its pilot ejected. 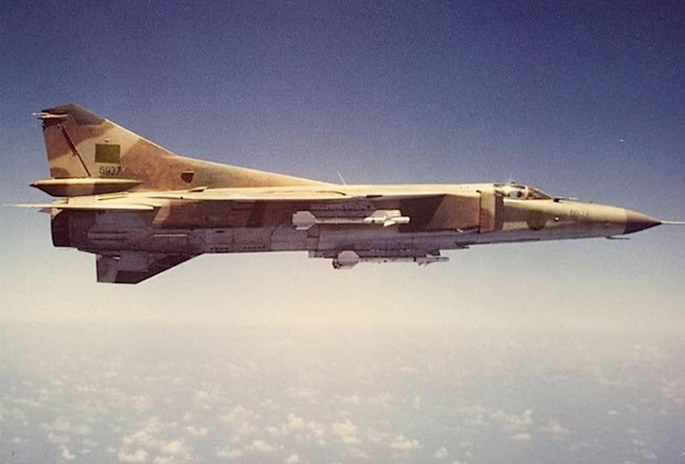 At 12:02:06 Connelly was at six o’ clock position of the first MiG-23 and reported “Good kill, good kill, I’ve got the other one” while switching on his stick to select Sidewinder. But no familiar tone came from the missile’s seeker head on his head set. While Enwright was shouting “Select Fox 2, shoot Fox 2”, Connelly switched back to Sparrow, but since they were overtaking the Flogger, he shifted again to Sidewinder which eventually emitted the right tone. Connelly pulled the trigger, the missile left the left wing station and hit the MiG-23 in the fuselage just behind the cockpit. At 12:02:36 Connelly reported to the E-2C that they had “splashed two Floggers and that there were two good ‘chutes in the air”. In the days after the engagement Libya tried to confuse things by asserting that the Floggers were unarmed reconnaissance aircraft, but the video footage recorded in the Tomcats TCS (the Television Camera System, the camera mounted under F-14’s nose which enhanced crew ability to identify the enemy early in an engagement) clearly showed that the MiG-23s were armed with air-to-air missiles, proving that Libyan fighters represented a real threat.